I’ve been loving the Ex Novo beers that have been showing up in my favorite bottleshop/taproom, including The Most Interesting Lager in the World and Stiff Upper Lip ESB. 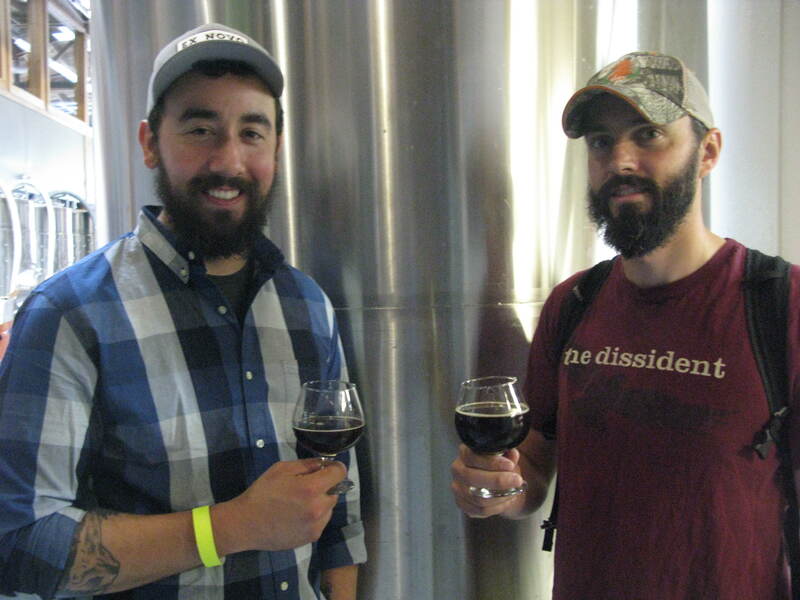 But to really sample the range of great beers made by head brewer Jason Barbee (above, with The Commons brewer Sam Pecoraro at last year’s anniversary bash) it’s best to head to the source, and this Saturday is a prime time to do just that. The Ex Novo crew is shutting down the street again to celebrate two years (and my birthday, I’ll continue to believe, despite lack of official – or any, for that matter – confirmation of the fact) with a block party featuring live music, reserve beers, an Anniversary Beer bottle release, BBQ, games, fun and general awesomeness. The party starts at noon Saturday July 9 at the brewery, 2326 N. Flint St., and music starts shortly therafter with Corner, There Is No Mountain, Fanno Creek and – at 6 pm, The Lonesome Billies. Saison Lillis; Where the Mild Things Are; Thick as Thieves; It’s Business Time, Kiwi Session IPA; Brexit Through the Gift Shop, English Summer Ale; Star Spangled Lager; Paddy Wagon Nitro Stout; ’15 Kill The Sun, Bourbon & Pinot aged Imperial Stout; and ’15 Peaching to the Choir. Also BBQ and the Pip’s Original Doughnuts truck will be onsite. 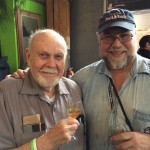 the Second Anniversary Beer – Duo, a Barrel Aged Peach Lambic, plus private tours with Ex Novo founder Joel. Migration is celebration Oregon Craft Beer Month by releasing a new beer every Friday, starting this week with The Pils I Took, described as a crisp light bodied lager with a subtle herbal spiciness and a hint of lemon on the nose (4.3percent, 26 IBU). Next week is Pablo’s Honey (6.9 percent, 20 IBU,) Sambucus Saison refemented in a oak wine barrel with local honey and Brettanomyces. ISA Got Back, 4.4 percent India Session Ale, will be released on July 22. 11am- 4pm Saturday July 9, Portland Brewing Company Taproom, 2730 NW 31st Ave.; Free entrance, food & beer available for purchase. $10 to Taste test the four cupcakes; $16 paired with the beers in each recipe. Craft beer is a perfect ingredient for sweets, so Portland Brewing teamed up with Friendly House to host a beer-infused cupcake competition featuring Piece of Cake Bakery, Fat Cupcake and Bella Cupcake. Also: Live music from The Beacon Street Titans; photo booth, face painters, games & giveaways; dunk tank; cupcakes; food from Portland Brewing; special appearances by local superheroes; and more. Ninkasi celebrates ten years with a party that feature 10 beers including a special tapping of N10 Anniversary Blended Ale, and a raffle whose prize is the handcrafted Ninkasi fire pit. In the spirit of collaboration and comic book greatness, the folks from neighboring Books With Pictures will also be in the house with some great comic books to browse and purchase. Come dressed as your favorite comic book character and you might even win a prize. Gigantic & Bailey’s Taproom tap a special firkin of Half Pint ISA – dry hopped with Amarillo hops and keg of VIVID Imperial IPA. 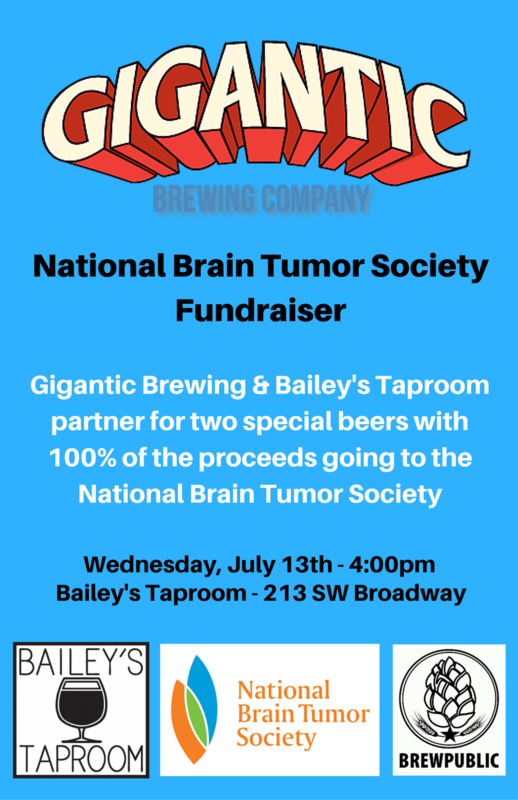 100 percent of the sales of both beers go directly to the National Brain Tumor Society (A 501(c)(3) nonprofit). Brewpublican Angelo De Ieso is fighting an Oligodendroglioma and spearheading the effort. Vivid Imperial IPA features Wai-iti and Kohatu hops from New Zealand and the intriguing tropical and citrus aromas and flavors derived from these unique hops. 5 – 9 p.m. Wednesday July 13, Willamette Week, 2220 NW Quimby St.; $22 BBQ ticket includes two beers for 21 & older; BBQ ticket is $18 for under 21. 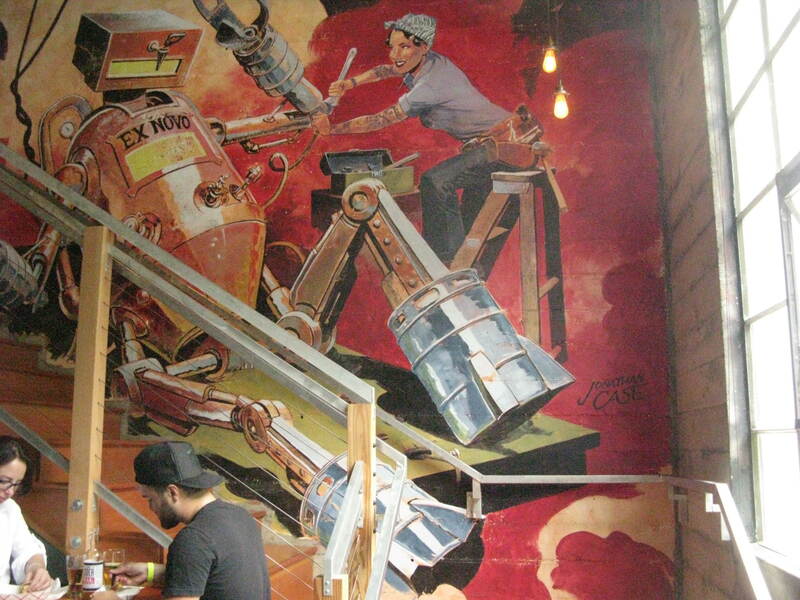 Willamette Week closes down Northwest Quimby Street for an epic block party that include the Best BBQ Championship, featuring the head chefs from Podnah’s Pit Barbecue,Reverends BBQ, Russell Street BBQ, Southland Whiskey Kitchen and others. Enjoy vendors and samples of Portland’s favorites: popsicles, budtenders, bike shops, bakers, tattoo artists, condiment makers, distillers, brewers and so much more, including surprise visits from some favorite local celebrities. Music will be provided by XRAY FM and the evening line-up, including WW reader’s poll Best Radio Show finalist DJ Anjali and The Incredible Kid. Proceeds from the party benefit nonprofit partner Village Gardens, Janus Youth Programs, a community supported agriculture organization in North Portland providing individual and family garden plots, employment opportunities for adults and teens, after-school and summer activities for children, homework clubs, an emerging livestock project, a Community Health Worker program, our youth-run entrepreneurial businesses and more.